How Live TV Helped America Mourn The Loss Of JFK Critic David Bianculli remembers watching the original news coverage of Kennedy's assassination — four days of unprecedented television — when he was 10 years old. He recalls how from that point on, TV, not radio, was the dominant medium for breaking news. Explore NPR's coverage of the 50th anniversary of the JFK assassination. 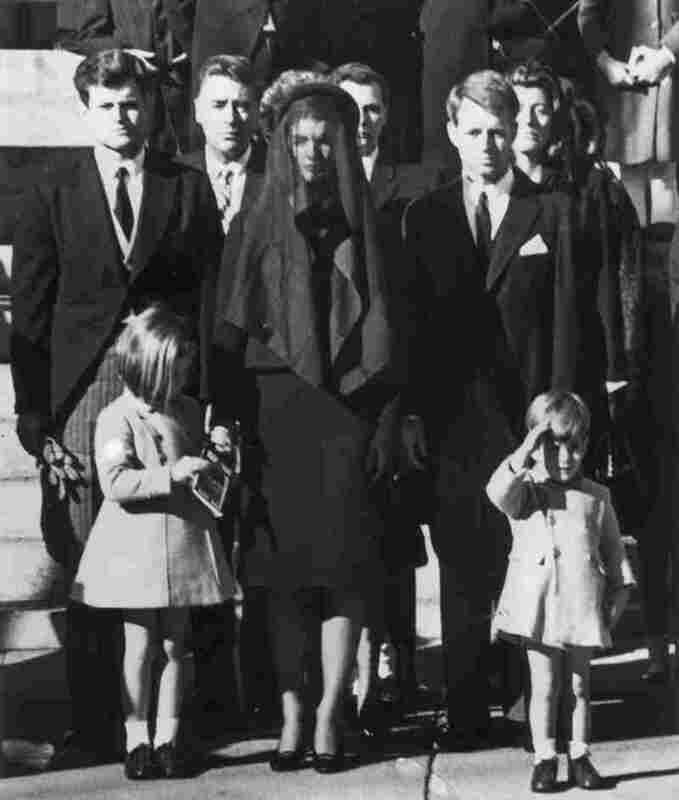 During JFK's funeral, live TV coverage helped make John-John Kennedy's salute an indelible image of American history. All this month, there has been so much TV programming devoted to JFK — documentaries, biographies, made-for-TV movie dramas — that I almost feel guilty adding to the media mix. But the 1963 assassination of John F. Kennedy, and the four days of television that followed, deserve all that attention. It wasn't just one of the most important moments of TV history; it was the most important moment — more than the moon landing in 1969; more than Sept. 11 in 2001; more than anything, period. If you think back to those first morning hours of Sept. 11, you probably remember turning on the television and staying there — watching, in amazement and grief and fear, as one dramatic event after another spilled out in real time on live TV. It's the closest our current generation has gotten to the feeling of those four days in 1963. But back then, on television, it was unprecedented. When Pearl Harbor was attacked in 1941, that news bulletin, and all that followed, was delivered by radio. Television, and TV news, didn't start until World War II was over — and even then, it was a largely crude affair. Edward R. Murrow's See It Now newsmagazine was a glorious exception, but nightly TV news was a small-scale affair. CBS News, with Walter Cronkite at the helm, was the first evening network newscast to expand from 15 to 30 minutes — and that happened only two months before Kennedy was shot and killed. Gross: When you went on to say that Kennedy was dead, your eyes teared and that's something we've seen replayed so many times, on every anniversary of the death, and it's become one of these historic moments of broadcasting. Were you concerned about getting emotional on the air? Did you try to be as emotionless and stoic as possible, and were you concerned when you realized that your eye was tearing? Cronkite: Well, I wasn't concerned about my eye tearing, I was concerned about my voice choking and not being able to speak. That concerned me quite a lot. The tearing didn't matter. I certainly didn't really think about it except the concern that I wouldn't be able to get the words out. Gross: How close did you come to not being able to get them out? Cronkite: Pretty close, I think. I remember a moment of real terror that I was going to choke up and fall apart, as it were. That news event, like so many others from the '60s, now seems to belong almost exclusively to Cronkite, who at the time earned the title of "the most trusted man in America." But all three networks — there only were three then, CBS, NBC and ABC — stayed on the story for all four days. Only NBC was broadcasting live when Jack Ruby shot Lee Harvey Oswald, Kennedy's alleged assassin; and no one, at the time, had access to the famous 8 mm film footage taken by Abraham Zapruder, the only photographic record of the assassination itself. In fact — and it's now a somewhat stunning fact — that footage wouldn't be nationally televised until 1974, 11 years later. It would be shown, for the first time, on a late-night ABC special hosted by, believe it or not, Geraldo Rivera. I was in grade school, and had just turned 10 years old, that day in 1963 when JFK was shot. Our teachers told us what had happened and dismissed class for the day. I walked the four blocks home, by myself, and found my mother asleep. I called my dad, who told me to wheel our only TV set into my bedroom and lock the door until he got home from work. My parents were both Kennedy freaks — years earlier, I'd been allowed to stay up to watch both the debates and election night — but my mom was very ill then, and my dad didn't want her to face the news without him. So I locked the TV in my room, turned it on and watched. Alone. And kept changing channels and watching some more, until my dad and sister came home. Then we all watched, for days, and grieved together. When Ruby shot Oswald, we were watching; when John-John saluted his father's coffin, we were watching — just like, at that point, almost everyone else in the country. Mythologist Joseph Campbell called those four days of TV coverage "a deeply significant rite of passage." The nation mourned together by watching TV, and from that point on, TV, not radio, was the dominant medium for breaking news. CNN and other 24-hour news networks were decades away, but those dark days in 1963 provided the template. So 50 years later, how has TV progressed? Technologically, of course, there's no contest. One of the many JFK specials this month was an installment of the PBS science series Nova, which used the latest forensic, ballistic and computer technology to conclude, ultimately, that Oswald was the lone gunman. Nova had done the same thing 25 years earlier, proving the same thing with now-dated resources — and also proving, if nothing else, that television loves an anniversary. For the 50th anniversary, in addition to that new Nova entry, the best retrospectives have included 48 Hours on CBS, The Sixties on CNN and American Experience on PBS. But in another respect, TV news hasn't matured much at all. Yes, we have lots of prime-time news shows and 24-hour cable news networks. But who, today, is the equivalent of Walter Cronkite? Who, today, is the most trusted news anchor in America? There's no obvious answer to that question — and that, in terms of the evolution of TV news, is certainly not progress, at least not to me.